Symptomatic celiac disease driving you crazy? Then try CeliAction with me! “The definition of insanity is doing the same thing over and over and expecting different results.” A whole bunch of dubiously wise people have told me that. The quote’s attributed to every famous smart person ever, usually Albert Einstein, and it has a certain ring of truth. So I hope you won’t blame me for wondering . . .
I’ve been dutifully eating gluten-free for nearly a year and a half. But despite saying no to wheat, rye, barley, and even oats over and over again, I’ve seen so little improvement in my health that celiac disease is starting to seem like a sick joke. I can’t help but wonder: Are all those people who claim to recover just punking me? Are you? Is it crazy to continue a rigid, socially hobbling diet without any signs that it’s working? Repeating the same constructive behavior over and over, hoping (one day) for a positive result is difficult but virtuous. . . .
Perseveration feels compulsive, hopeless, helpless, automatic and unsatisfying. There is a desire to stop, but stopping doesn’t feel like an option. Perseverance feels like striving toward a noble goal, and whether or not it’s reached . . . there is virtue in the effort. Now, I can’t say that avoiding gluten never feels compulsive, hopeless, helpless, automatic, or unsatisfying. But usually, I feel I’m doing something constructive in hopes of (eventual) better health. The day-to-day results may be nil, but I won’t be giving up my diet anytime soon. On the other hand, just as it’s not crazy to keep striving in the same way for a noble goal like health, it’s also not crazy to try something new. If you aren’t seeing as much progress as you’d like, it’s a good, sane idea to take extra steps that might help you reach your goal and keep you from going nuts along the way. That’s why I’m excited to report that I have enrolled in the CeliAction Study! The CeliAction Study is testing ALV003, a medication intended to break gluten into pieces too small for the immune system to recognize. Even careful people like you and I probably get trace contamination; this drug may keep our immune systems from punishing us for it. It’s worked in a test tube, and only science will tell whether it works in humans. Now, I don’t believe in medicating problems that have effective, simple, non-pharmaceutical solutions. But I do believe in medicating everything else. If the gluten-free diet were good enough for everybody, I’d be shaking my head at those money-grubbing drug companies with the judgiest of ’em. But for many, it isn’t. I believe that developing new therapies for celiac disease is a necessary cause, and I look forward to supporting it. If you’re interested, I invite you to join me! Like another infamous study, it’s placebo controlled (and double blind), so you won’t necessarily get the drug, and either way you won’t know. You also have to show ongoing intestinal damage in the first endoscopy to be given the drug or placebo. But IF you get the drug, and IF it works, THEN your quality of life might improve. It’s quite possible I’ll hate the phone calls by the end of the study, and maybe I still won’t feel better. Maybe I’ll feel crazy for having gotten myself into this. But mostly, I hope, I’ll be happy that I’m persevering toward my noble goal of better health. And if you’re still striving for it yourself, I’ll appreciate the company. Us crazy people gotta stick together. Does managing a special diet ever make you feel a bit insane? What new things have you tried in pursuit of health? Are you considering the CeliAction study? We’ve all heard statements like these about gluten-free food: “The gluten-free products market is experiencing a double-digit growth” and “They are considered healthier than conventional products (source: PRWeb.com). It’s become a truism that manufacturers make gluten-free products to cater to the “fad,” rather than to help those of us with gluten-related disorders (GRDs). According to this perspective, gluten-free, like organic, all natural, and wholesome, is just another buzzword. Is it true? 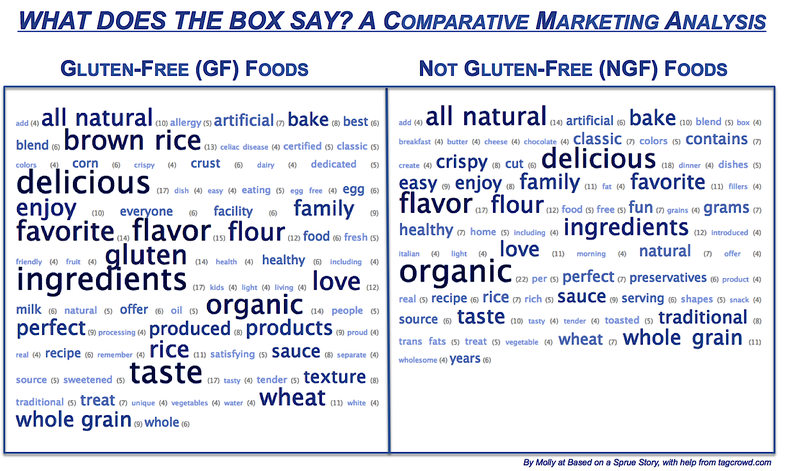 Just who do marketers think gluten-free consumers are, and what do they think we want? Are GF labels crammed full of more health claims than other products? Are they feeding us all the nonsensical health claims they think we’ll swallow? Looking these over, I’m come up with some conclusions of my own. I’d love to hear what stands out to you, too! 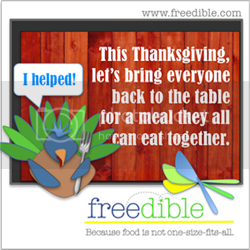 I researched descriptions of both gluten-free (GF) and non-gluten-free (NGF) products. Note that the sample size is small—just under 60 products in each category—and that I used copy from manufacturers’ websites, rather than package labels themselves, because I’m lazy. Pay me $3,995 and I will redo it. For a full list of the products I included, click here. I looked only at brands with exact gluten-free and non-gluten-free equivalents. (Thanks to Sprue Jr. for this smart idea.) I left out things like Goldfish Puffs (which are yummy, but more like Cheetos than Goldfish), Nabisco Rice Thins (which I really hope aren’t meant to imitate Wheat Thins), and Chex (even though it’s the classic mainstream-product-gone-GF; wheat, rice, and corn Chex are just too different). I created the word clouds using tagcrowd.com. A word or phrase had to appear 4 times across all descriptions in a category to make the cut. The NGF cloud is smaller than the GF cloud because fewer words were repeated often enough. At 33 mentions each, the outliers “gluten free” and “gluten-free” (who knew the food industry was so divided on the hyphenation question?) were taking over the whole GF picture, so I removed them. As a vegetarian, I had no idea till doing this just how many brands of GF breaded chicken products exist. Mind. Blown. You’d think someone could take a break from dinosaur-shaped extruded meat to manufacture some GF phyllo dough. Some classic, mass-market products reproduced in gluten-free versions are presented with almost identical product descriptions, distinguished only by the addition of “Now available gluten-free!” In other cases, the gluten-free product information is considerably longer, taking great pains to explain a) why a gluten-free version was created, b) what steps have been taken to ensure the product is gluten-free, or c) both. The NGF versions were very rarely longer, probably because we already know those foods rock. Many food manufacturers making GF products were already focused on whole grains, organics, etc., which in my opinion partially contradicts the claim that everyone’s getting into the GF game to make money. These are companies that already cared about health and want to include former customers, now gone GF. Whether their products really are good for us is another question. Poptarts: not yet gluten-free, or healthy. GF food tastes good, kinda. To give the GF labelers credit, many of them call their products “treats.” They promise that “everyone” will “enjoy” or even “love” their foods’ “delicious” “flavor,” “taste,” and “texture” (on the last point, they may protest too much—the word doesn’t appear in the NGF cloud, because it doesn’t have to). “Best” and “favorite” make the cut for GF (but not NGF) foods, though they’re slightly more wary about claiming to be “classic” or “traditional” (several GF products went for “unique,” instead, which could mean anything). NGF foods are apparently “easier” and more “fun” than GF ones, but then, we already knew that. GF foods are good for you, kinda. First, let’s take a moment to appreciate how silly it is that health claims like “all natural” are so prominent in both sets of product descriptions, considering that every one of them comes in a package, box, or bag. A recent comment by a reader, John, sums up my feelings on this topic better than I could myself, so check it out. With nearly as much frequency as NGF products, GF products reference “whole grains,” but the oversized “brown rice” tag signals that’s the primary whole grain being used; too bad, because it’s lower in several nutrients than the whole wheat that dominates in NGF foods. Neither set of products makes many caloric claims, probably because these terms are closely regulated so pizzas, cookies, and pretzels can’t get away with claiming to be low-cal. Only the GF products admit to being “sweetened” (though the NGF ones are, too!). GF foods are gluten-free, kinda. A fair number of the GF products point out their “certified” status and make explicit claims about the safety of their “ingredients” and “dedicated” “facility” where “products” were “produced.” A handful even reference “celiac disease”—yay! Others, though, are mentioning their facilities and so on to warn us that they aren’t dedicated. So take this one with a grain of salt, produced in a gluten-free facility. GF foods are far more likely than NGF foods to mention freedom from allergens such as eggs and dairy (and wheat, mentioned more on products where it’s not than where it is). I don’t mind manufacturers killing two (or more) “allergies” with one stone; in an age of multiple allergies, it’s a smart move. Where are the labels? Are these healthy? Gluten-free? Who knows?! At least in this sample, the GF foods don’t seem to trumpet health more than their NGF counterparts, other than freedom-from claims. I was also surprised not to find the words “crave” or “craving” in the GF cloud, since that’s the essential function of these foods: to satisfy that yawning hole left in all of us by the Oreos, pizzas, birthday cakes, and chicken nuggets of yesterday. Which similarities and differences surprised you? Are any words missing that you’d have expected to see? Do you buy gluten-free food products, and if so, what do you look for on the package labels? Is Kosher the Next Gluten-Free? Big trend? Kosher? I didn’t get it. Yes, some people of Jewish heritage and/or faith keep kosher, but by no means all (the majority of my Jewish acquaintances, for example, do not). How could something so very specific to the needs of a relatively small segment of the population become a big food trend?, I wondered. Then the writer mentioned gluten. Oh, I thought. Right. Now, kosher and gluten-free aren’t totally dissimilar. One of my coworkers keeps kosher, and for an office potluck, she brought in a zucchini bread, with a clean kosher plastic knife that she asked everyone to use—“because otherwise I won’t be able to eat it.” I’d brought in a soup, which I dumped into a presumably gluten-contaminated pot to heat on the stove—except for the single serving I’d reserved in a clean gluten-free container to microwave for myself. Both she and I were too trendy to eat what the others had brought. Additionally, for some people who don’t keep kosher, there are health-related advantages to choosing kosher foods. Vegetarians can be confident there’s no animal-derived rennet in kosher cheese, just as those with wheat allergies can be [fairly] confident there’s none of that in gluten-free foods. People who enjoy putting arbitrary restrictions on their food intake in hopes of losing weight are just as well off choosing kosher foods as gluten-free ones. Plus, foods that are “Kosher for Passover” must be grain-free, and anything grain-free is automatically gluten-free (though the converse is not necessarily true). Many kosher-certified products are therefore certified GF, too—for example, such health foods as Katz cinnamon rugelach and chocolate-frosted donuts, and Glutino chocolate vanilla crème sandwich cookies. On the subject of sandwich cookies, let’s consider the Oreo. A fine (though not gluten-free) occasional treat, at 160 calories in a serving of three (if you can stop at three), Oreos are predominantly composed of refined flour, oil, and high-fructose corn syrup, and offer little nutritional value. A health food, the Oreo is not. But what it is, is kosher. In “probably the most expensive conversion of a company from non-kosher to kosher,” according to Prof. Joe Regenstein, Nabisco converted its cookie formula to cut out lard (derived from pork), and blowtorched all of its factory equipment to remove remaining traces on the lines (in the process destroying, and later replacing, some expensive equipment). All that just to beat out Hydrox, a competing—kosher—brand that existed before Oreos. When Oreos cut out the lard, they gained enough new customers to cut Hydrox out of the sandwich cookie market. Today, many of us have never heard of Hydrox, and for good reason: it no longer exists. Similarly, though I love Katz and Glutino, I know that their gluten-free (and kosher) desserts are treats, not health foods. You know that, too, I’d wager. But does anyone want to place bets on how few people in the US and worldwide do? Will that happen? To make a probably not kosher joke…dear G-d, I hope not. I don’t think this needs a caption, do you? What do you think? Is kosher poised to become the next big thing? Are there health benefits to it that I’m missing? What package labels make you think a food is healthier?